One thing is for sure: Cleveland is passionate about its sports franchises! 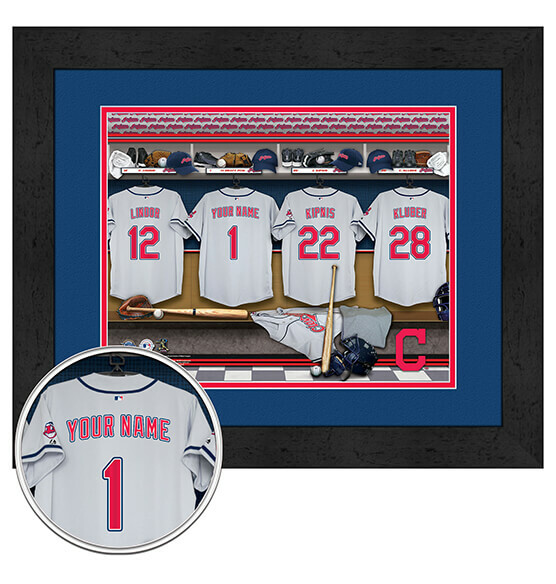 Whether you're part of the Tribe or know someone who is, this Personalized Locker Room Framed Wall decor is a guaranteed home run. Purchased for yourself or as a thoughtful gift, this high-quality piece will undoubtedly be a conversation starter when hung in your home or office. It features a double mat inlay with team colors and highlights your name on the back of a jersey, up to 12 characters, standing among other Indians superstars in the locker room at Progressive Field. This piece comes with a sleek black frame, glass, high-quality paper and an included sawtooth hanger for easy mounting.